I did a post like this one last year, you can see it here if you are interested. 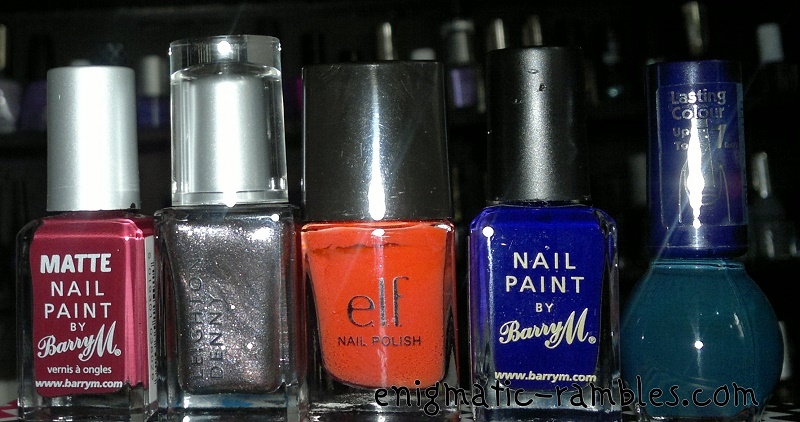 Now that it is officially Autumn I thought I would share my top five polishes for this season. First I have Barry M's Matte Crush, which is a deep burgundy matte shade which also looks great with a shiny topcoat over the top. 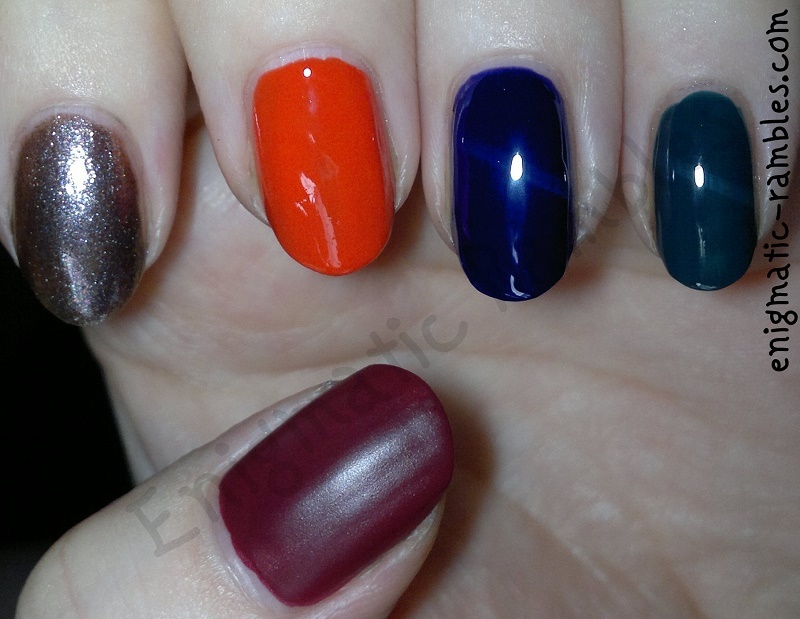 Then Leighton Denny's Be Unique which is a browny / rusty shimmer colour, you do need three coats to achieve opacity but it would also work layered over a red or an orange base. ELF's Fire Coral, is a mid-orange cream polish which is perfect for Halloween nails and of course orange is a prominent colour in nature throughout autumn. 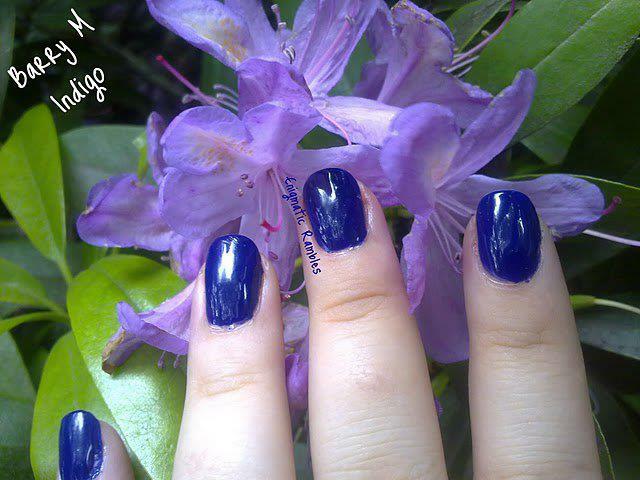 The deep purple is Barry M's Indigo, and is the perfect Cadbury purple. Very difficult to colour accurately photograph. The bottle shot and the photo of the skittle nails above aren't accurate, the photo below is much more true to life. It is a deep colour but not one which looks black and is easier to wear. I need to get a new bottle of this as I seem to be at the very end of this bottle. 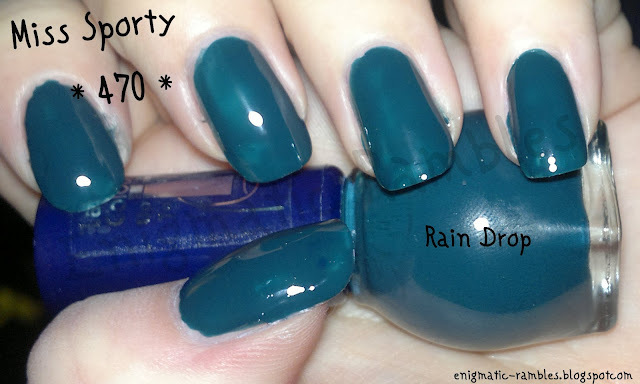 Lastly I chose Miss Sporty's Rain Drop which is a dark green, something a little different from a pure black polish. Lovely and creamy and deep and the brush is quite flat and wide.